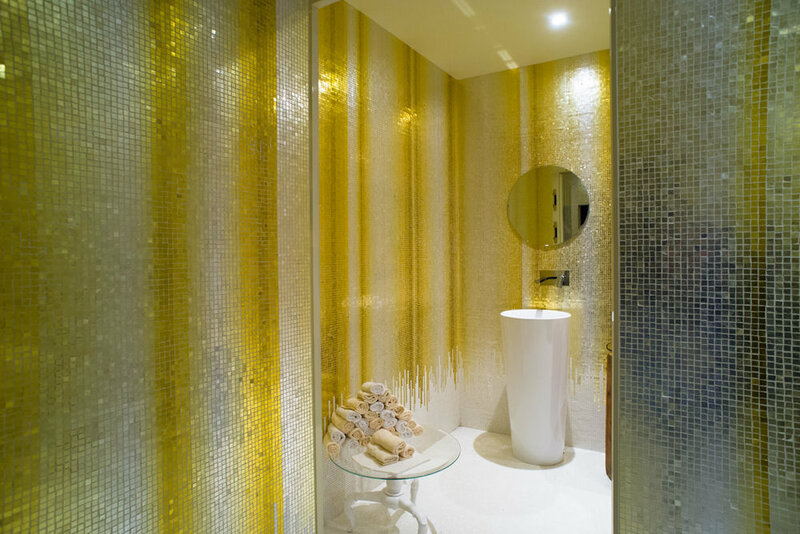 Since centuries, in Venice the golden leaves were used for the production of the mosaic tiles, in glass decoration and restoration of the frescoes. Where did this ancient art, the Battioro, come from? As far as I know, it arrived in Venice around 1000, from Byzantium, but what a surprise when, during one of my photo workshops in Myanmar, we made a stop inside a shop for the processing of gold leaves. We know for sure that Marco Polo passed through Burma, during his long journey to the East and I immediately noticed that the processing of the gold leaves takes place in Mandalay in exactly the same way I saw in Venice! Of course the atmosphere is a bit different, and the climate as well, but I saw enough similarities to wonder whether this ancient art has been somehow affected in one or another direction. 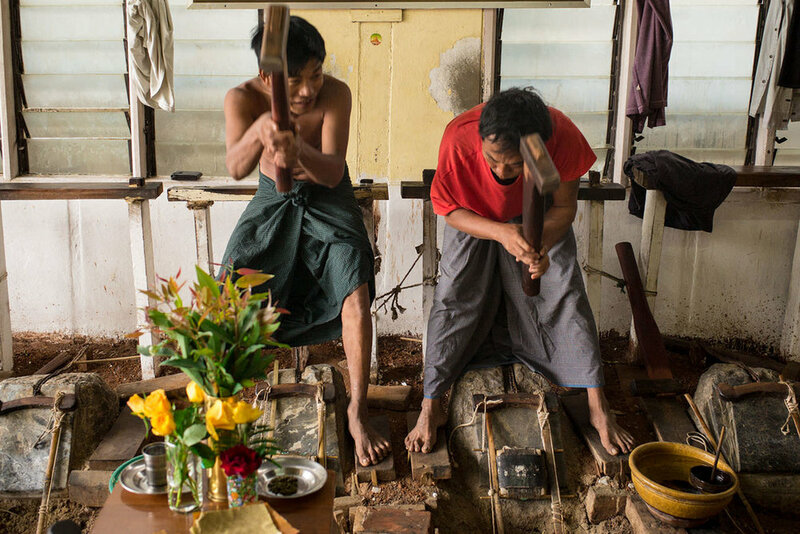 The Burmans make heavy use of gold leaves in their prayers, when they stick the gold leaf on the Buddha statues, or on the Gold Rock. Some statues depicting Buddha, after being held for centuries and centuries of gold leaves have completely changed the way they look and the now appear unrecognizable, such was the devotion of Burmans! But let’s back to Venice. You must know that until the '700 in Venice there were more than 300 craftsmen who worked the gold leaves, each one in a specific stage of the production and as I’m always attracted by what still now lives of these ancient traditions, I visited my friend Marino, near to Fondamente Nuove, the last Battioro remained working with this ancient craft, according to a manufacturing process remained virtually unchanged over the centuries. One more surprise regards the place where, in Venice, the laboratory is located, it’s inside the former house of the great painter Tiziano Vecellio!!! Let’s cross the entrance of this building full of history, and let's see how is the production of this precious metal. All begins with the gold melting, pure or in addition of other materials, until you get a nice gold ingot! Then (do you remember the noodles?) the ingot, passing through the midst of the rollers becomes a many meters long tape. Then you cut it into small squares, you place them in a "book", and you begin the hummering above a block of marble, reducing the gold shape in increasingly thinner parts. The gold leaves are then cut and collected in booklets of paper, ready to be used. What are today's use of gold leaf produced by hand? Since centuries they were used for the production of the mosaic tiles, in glass decoration and restoration of the frescoes, now you can use them in cosmetics, medicine, and in the kitchen too, to prepare some special dishes! In Campo San Stae (San Eustachio), next to the façade of the baroque church, built in 1709, leaning on the left side, there is the Tiraoro and Battiloro School, who moved here in 1711 after, from Ss. Filippo e Giacomo, where it was founded in 1420.